Frances was taken from her mother, in Cumberland, Maryland, to Natchez, Mississippi, and then New Orleans, Louisiana. 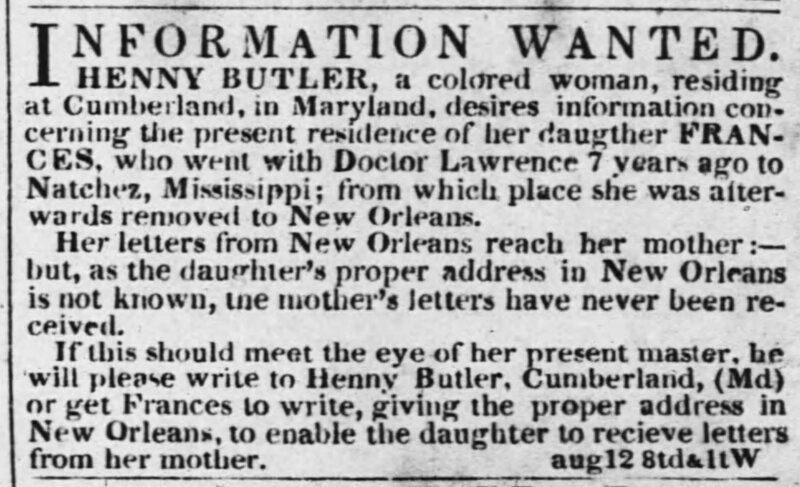 Her mother, Henny Butler, received letters from her but needs her address in New Orleans to reply. An antebellum ad (from 1843). 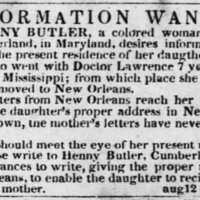 “Henny Butler searching for her daughter, Frances, before the Civil War,” Information Wanted Ad, New Orleans Daily Picayune (New Orleans, LA), August 12, 1843, Last Seen: Finding Family After Slavery, accessed April 19, 2019, http://informationwanted.org/items/show/3299.